Del. William Frick recalled how the county Liquor Control Board failed to reliably deliver supplies to some restaurants and beer and wine shops at the height of holiday season in recent years. 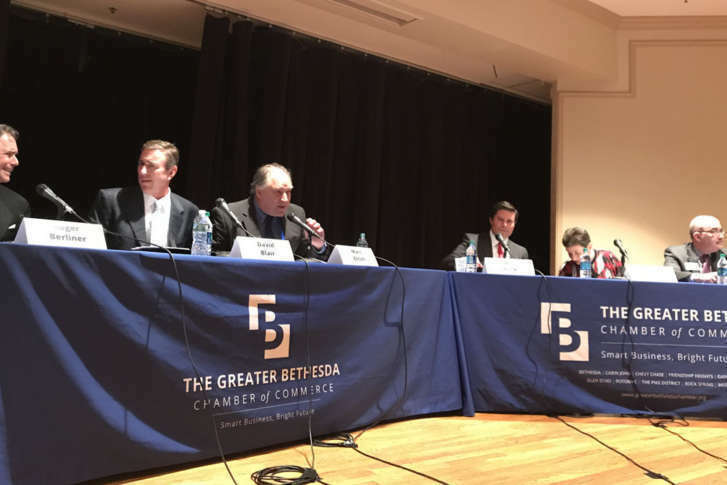 WASHINGTON — With holiday party season about to begin, elected leaders in Montgomery County disagreed over the government’s control of liquor in a debate on Wednesday. The disagreement concerned whether the county government should maintain its 84-year-old monopoly over the distribution and sale of liquor as well as the distribution of all alcohol in the county. Private stores sell beer and wine distributed by the county, and the county alone controls wholesale and retail sales of liquor. At the debate between six Democratic candidates for county executive, state Del. William Frick of Montgomery County recalled how the county Liquor Control Board failed to reliably deliver supplies to some restaurants and beer and wine shops at the height of holiday season in recent years. Some of the other candidates including Rose Krasnow and David Blair also thought the county should end its monopoly, though Krasnow said it’s not a top priority. “I am the only person on the County Council that does believe it’s time to end our unique liquor monopoly,” said County Council President Roger Berliner. The county-run liquor stores provide about $30 million dollars annually to the county. “If I had a business that was throwing off a $32 million profit and someone told me you weren’t managing it right, my response would be not to dump the business but to bring in decent managers, which we did, so that I could make more money, not less money,” said councilmember Marc Elrich. Councilmember George Leventhal warned that the county must be very careful before abandoning its liquor business. “The biggest problem is not the revenue stream. The biggest problem is the $100 million of outstanding revenue bonds secured by that revenue which were used to build the Montrose Parkway,” Leventhal said. But Leventhal suggested that if a buyer offered enough money for the county’s 26 liquor stores to retire the bonds, then the offer should be considered. While Virginia operates state liquor stores and there’s a liquor control board in Prince George’s County, no jurisdiction maintains Montgomery County’s iron-grip on alcohol sales. “No other county in the country has a monopoly over both the wholesale and the retail function … It does not serve us,” said Berliner.